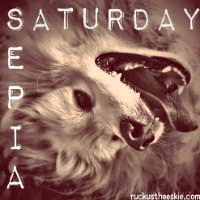 Ruckus the Eskie: Sepia Saturday #104: It's beginning to look a lot like Christmas! Sepia Saturday #104: It's beginning to look a lot like Christmas! Always looking forward to the ginger-based snacks! We love the ginger ones too Ruckus!! Happy SS!! Love your little ginger bread man! Glad to see you are enjoying the lead-up to Christmas! Gingerbread men are so nice! A little man to eat, sounds perfect! Gingerbread men are the best!! Merry Christmas!! How can a treat be so cute?? ?